Larenim Mineral Makeup's 2-WM Warm Tone Pressed Foundation goes on smoothly and builds easily to create complete coverage for a flawless, natural look. 2-WM Pressed Foundation contains only natural ingredients, creating natural color from pure minerals. This foundation is ideal for those who have light skin with golden undertones and blends easily for a clean look that isn't heavy or cakey. With buildable coverage, you'll always get the look you want that lasts all day and night. 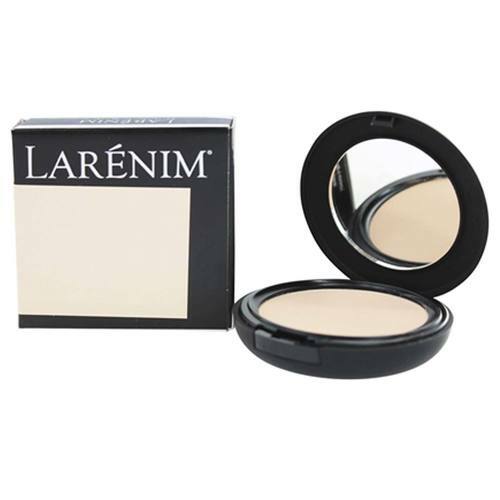 Get the skin others will envy with Larenim 2-WM Pressed Foundation. Order it today and save big! Advertências: For topical use only. Do not ingest. Keep out of reach of children. Will shatter if dropped. Notas: 2-WM Warm Tone Pressed Foundation is an adjustable coverage foundation. Therefore, if you want higher coverage simply sponge on until your face is covered. If you want less coverage, distribute smaller amounts with the sponge. Pressed minerals can double as a concealer as well. Use the Camouflage Oval Grande brush to apply a small amount to conceal blemishes or under-eye circles. Use a Kabuki brush if you want a lighter all-over application. INGREDIENTS: Mica, Organic Cold Pressed Jojoba Esters, Zinc Stearate, Boron Nitride, Lauroyl Lysine (coating for Mica), Honeysuckle Flower Extract(Lonicera caprifolium and Lonicera japonicum) and Vitamin E (Tocopheryl Acetate). RECOMMENDED USE: 2-WM Warm Tone Pressed Foundation is applied with the included sponge. Simply wipe the sponge across the pressed minerals and distribute evenly on face. Do not wet the sponge first. The sponge can be washed with a cleanser and dried overnight.